While officials said preliminary lab results indicate little to no trace of oil content in water from the affected area, environmental groups fear that the continued lack of detailed information about the spill and the difficulty in cleaning up the mess will amplify the incident’s environmental impact. Eleven public beaches have been closed since Sunday in the wake of a collision between two vessels – one of them carrying 9,000 tonnes of palm oil. 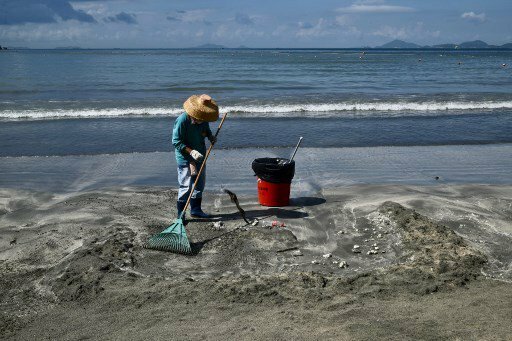 Although Hong Kong government departments have scooped up more than 50 tonnes of the white, gelatinous, lard-like pieces of crystallised oil, more of it is washing up on southwestern coastlines and now spreading to the east. Guangdong authorities had cleaned up 38 tonnes of palm oil as of Monday.